Rack up your AA miles even faster with the American AAdvantage Dining program. Earn miles when you eat out at participating restaurants. Read on to learn more. The first step towards earning bonus miles is creating an account. Signing up is free and takes 2 minutes. Remember to use the same name and email address as your AAdvantage program account. Also, make sure to stay opt-ed in by agreeing to receive periodic email alerts, so you earn 3 miles per dollar. If you opt-out, you only earn 1 mile per dollar, making being on the mailing list worth it in our eyes. You earn bonus miles based on the total cost of your meal, including tax and tip. The second step is setting up your membership. You'll be asked to provide your AAdvantage program number and mailing address, as well as create a username and password. Lastly, link your credit or debit card. If you have multiple cards that you want to use, go to the account information tab to add more. You need to perform this action in order to activate your account. Keep in mind that whichever card you link must not be linked to any other miles-earning dining programs, such as Delta's SkyMiles Dining, that belong to the Rewards Network. You will only earn miles if you eat at one of the participating restaurants, bars or clubs, and you use that card to pay. Each time you make a transaction, your AAdvantage Dining account will be updated (usually within a few days) to reflect your earnings. If you still don't see pending points show up after 10 days of your visit, contact AAdvantage Dining directly. Tip: It is helpful to save your receipts in case a pending reward doesn't show up on your account, as you will need to enter the date of your visit, amount spent, and the establishment's name and city. Or you can use your bank statements as documentation. Make it a goal to continue using your card at least 12 times within a year to become a VIP member. Make sure you hit the minimum amount, which varies, at each restaurant. This tier will allow you to earn 5 miles per dollar spent, which is right up there with any frequent flyer credit card incentive. Tip: Make sure to keep an eye out for emails from AAdvantage Dining about surveys and reviews, which they require you to fill out to get the bonuses. Take 1-2 minutes to write up a review ASAP after you visit each restaurant to avoid missing out. Don't live in these cities? You can still find participating locations for most metropolitan areas and decent-sized cities. There are over 11k+ participating locations throughout the US. For example, we found 229 results for Boston and 162 results for Seattle. 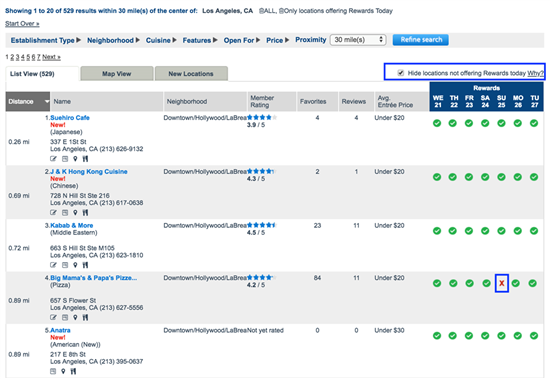 Search for restaurants within your area before signing up to make sure it's worth it. 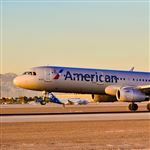 If anything, the AAdvantage program can be quite lucrative for business travelers who are in a different city every week or so and have no choice but to eat out. The key to earning as many bonus miles as possible is knowing the participating restaurants in your area and if there are any stipulations ahead of time. There are some establishments that don't allow you to earn points on certain days, may limit the number of qualifying visits per month, or have a cap on the total amount of points you can earn. A red X signifies that no points can be earned on that day. If you are searching for a place to eat the day of / last-minute, tick the "hide locations not offering Rewards today" box. 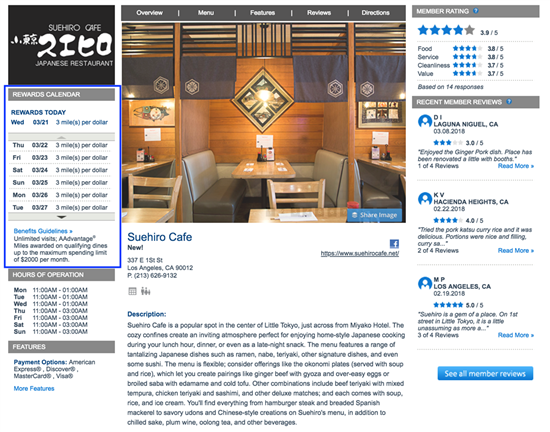 Click on the restaurant's name to check its reviews, hours of operation, description, payment options, rewards calendar and guidelines. Pay attention to the last 2 to double check the number of points you can earn per dollar on the day you visit, as well as if unlimited visits are allowed and if there is a maximum spending limit per month. 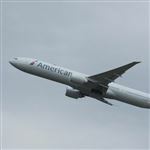 The deal is even sweeter for those who link and use an American Airlines credit card. Before signing up, it's important to consider the annual fee that you'll have to pay. However, if you know how to use the card to your advantage, it can be quite lucrative, and the annual fee will pay for itself. 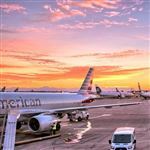 Citi AAdvantage Executive offers 50,000 American Airlines AAdvantage® miles if you spend $5,000 on purchases within the first three months of opening your account. Enjoy Admirals Club membership and complimentary Admirals Club lounge access for authorized users. This card lets you enjoy priority check-in (where available), priority airport screening (where available), and priority boarding (Group 4) on American Airline domestic flights. You also get the first checked bag free on domestic AA itineraries for you (and up to 8 companions traveling with you on the same reservation). There is a $450 annual fee. Citi Prestige earns 5x points on air travel and restaurants, 3x points on hotels and cruise, and 1x points on all other purchases. There is a $495 annual fee. Citi Premier earns 50,000 bonus points after you spend $4,000 within the first 3 months of account opening. This card earns 3 points per $1 spent on travel (including gas), 2 points per $1 spent at restaurants and on entertainment, and 1 point per $1 spent on other purchases. There is a $95 annual fee (waived for the first 12 months). Overall, the program is overwhelmingly easy to use! Why not milk it for as many bonus miles as possible? We recommend it to anyone who goes out to eat a lot (which is pretty common for professionals in big cities). Just remember to do a quick search to find out which restaurant to go to beforehand. Enjoy your meal and pay for it with your linked card so you can reap the rewards. It also pays to actually read the emails that the AAdvantage Dining program sends to you. Special incentivized deals are dispersed to existing members from time to time to boost spending. If you follow all the advice outlined in this article, you'll be booking a reward flight to your dream destination in no time! Tip: In rare cases when AAdvantage miles are about to expire, simply have a meal at one of the participating restaurants to reset the expiration date on your account. Disclaimer: The information for the Citi Premier℠ Card, Citi Prestige® Card, Citi® / AAdvantage® Executive World Elite™ Mastercard®, and Citi® / AAdvantage® Platinum Select® World Elite™ Mastercard® has been collected independently by CreditDonkey. The card details on this page have not been reviewed or provided by the card issuer. You don't need to fly much to earn a TON of American Airlines AAdvantage miles. Read on for 15 ways to earn AA miles fast. 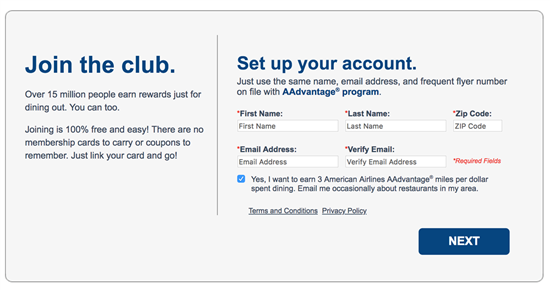 Leave a comment about American AAdvantage Dining: Complete Guide?